What do Tiggers like to eat for breakfast? Honey? Haycorns? Thistles? Take a trip through the Hundred Acre Wood to find out with Winnie-the-Pooh, Tigger, Piglet, Eeyore, Kanga, and Roo! This board book is based on A. 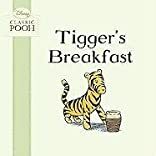 A. Milne?s classic story about the first time Pooh and Tigger meet. About Stuart Trotter (Illustrator) : Stuart Trotter is a published author and an illustrator of children's books. Some of the published credits of Stuart Trotter include Dribble, Elaine's Tulip, Whose Nose, and Polar White.